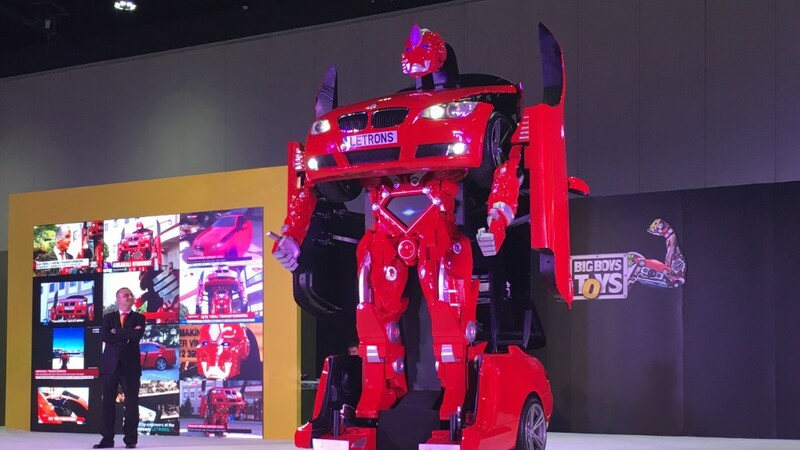 It's an action figure fanatic's dream: A real-life transformer is up for auction in Abu Dhabi, but you'll need at least $600,000 to make a bid. Antimon is a BMW 3-series car that transforms into a robot in 30 seconds. It's the work of 12 engineers and 4 technicians from Turkey, who spent 11 months putting their creation together. "We want to show our power all over the world," said Turgat Alpagot, sales and marketing director for Letrons, the Turkish startup behind the transformer. "We think if we do something like this it'll get great exposure all over the world." Alpagot says he's already received bids for Antimon at this week's Big Boys Toys exhibition in the UAE capital. The highest bidder can take Antimon home at the end of the exhibition on Saturday. The car isn't licensed for the road, and you can't drive it. But it can be moved by remote control at speeds up to 20 kilometers (12.4 miles) per hour. In its standing position, the robot can move its arms, fingers and head. Letrons hopes Antimon will be the first in a series of 12 transformers. The rest are in the research and development stage. Alpagot says the company has received interests from theme parks and shows looking to rent Antimon. What's next? The creators are seeking funding from private investors to develop smaller transformers that are more affordable and can be driven on the road.